>FOLLOW THE BLOG ON FACEBOOK & TWITTER AND CLICK LIKE/FOLLOW FOR REGULAR LOCAL, NATIONAL AND INTERNATIONAL WEATHER UPDATES, LINKS & MORE! THE BIGGEST, STRONGEST OF THESE MONSTERS PRODUCED SURFACE WINDS UP TO 250-300 MILES PER HOUR AND THE DEBRIS YOU SEE FLYING OUTSIDE OF THESE TWISTERS FROM HELL ARE PEOPLES LIVES BEING RIPPED APART, THEIR HOMES AND WORK PLACES TORN OFF THEIR FOUNDATIONS, THEIR CARS AND 18-WHEELERS LIFTING OFF THE GROUND AND GETTING HURLED THROUGH THE AIR LIKE A CHILDS TOY! 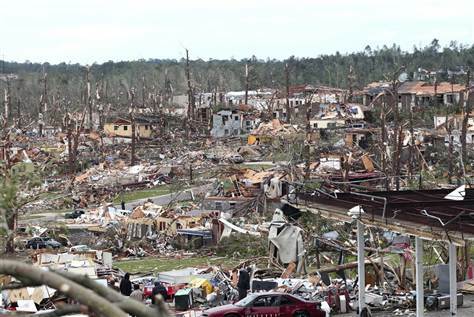 Overnight tornadoes leave part of Pratt City, a suburb of Birmingham, Alabama, in ruins April 28, 2011. The very front responsible for the tremendous damage wrought to the South raises concern now from coastal Carolinas up through the populated I-95 to Upstate NY this afternoon and evening! 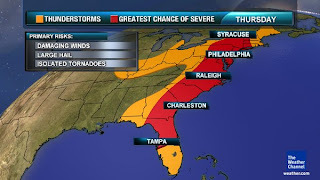 Above is the current map produced by TWC which shows where the highest chance of both strong thunderstorms and severe thunderstorms are most likely through the late PM and evening. 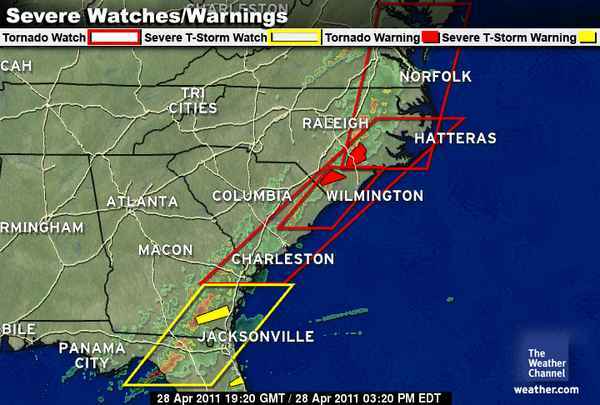 Once again, the risk of more tornadoes is imminent given the environment in place. Please please keep check to your local weather situation via TV and or radio throughout tonight. If you’ve seen the images and I know you will have, you should take that as a warning! 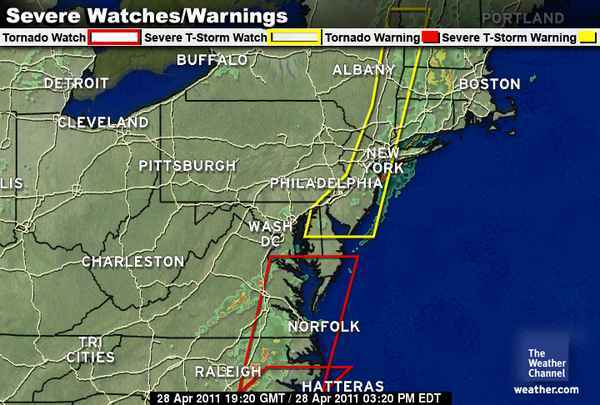 The above and below graphics are current maps of where the watches and warnings are currently in place. DO NOT go by the myth that tornadoes don’t hit major cities, they do and have done. Though, there’s perhaps a slightly lesser risk of a tornado strking Philly or NYC, it’s not out of the question and much stranger things have happened. It may only take a powerful storm to role through New York City tonight with 60 or 70mph winds and you’ve got tornado-like power even if there’s no an actual twister.. Get what I’m meaning? 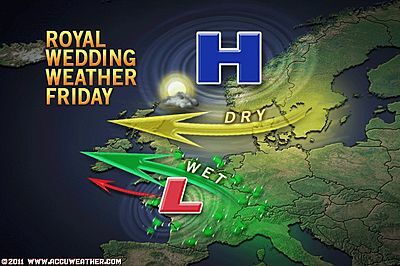 Scotland to enjoy mostly sunshine tomorrow, showers likely for Royal Wedding but by no means a washout! High pressure remains in control but unlike today and yesterday where there was wall to sunshine across most of Scotland with highs topping 17-20C, tomorrow looks likely to have patchy clouds but temps will still rise to between 17-20C with a Highland locale such as Aviemore, Mallaig or Kinlochewe that could reach 21C (70F). As for central and southern England, a breeze off the North Sea will pull clouds in, hold temps to around 15 or 16C at 10-11am but though skies may produce showers, they’ll be scattered and outbreaks of some sunshine is likely by early PM with temps climbing to around 17 or 18C. As dicussed earlier, the heat is moving into the Sub-Continent, and creeping into India now. The max temperature anomaly shows a East-West divide, temperature wise. The western region is now moving into the above normal” zone. The Highest in Asia on Wednesday was Dadu (Pakistan) at 45c and Idar (Gujarat, India) at 44.6c. Several stations in ssindh (Pakistan) too had 44c as their highs today. Karachi is back to 35c after soaring to 41c a couple of days back. No meaningful rainfall, except for some convective thundershowers in Kerala and Orissa. Some thundershowers expected in Lower Sindh region of Pakistan on Thursday/Friday. Cloudy weather for Karachi on Friday. Though Kathmandu received 1 mm of rain on Wednesday, a little more could be expected on Thursday and Friday, tapering off by Saturday. More discussions on the situation in MW-4, which will be up tomorrow (Thursday). As I will be proceeding to Bandhavgarh Tiger Reserve Forest, there will be no Vagaries published till Thursday, 5th May. CLICK HERE FOR MORE FROM OUR PARTNER BLOG!! 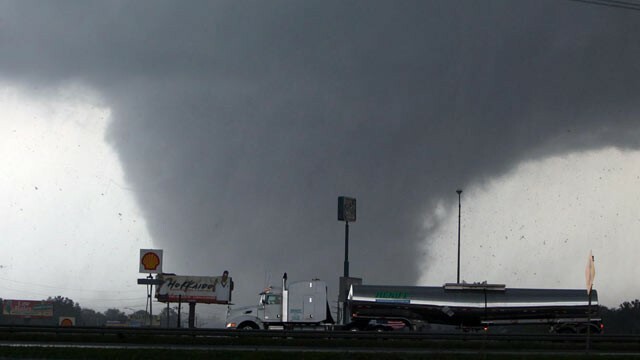 Stats on The Deadliest Tornado Outbreak In My Life!